Perennial (rarely annual) herb from a sometimes woolly, short-branched crown and a taproot; stems ascending to erect, several, simple or rarely short branched, smooth or spreading-hairy, 5-25 cm tall. Basal leaves lanceolate or more often linear, 12-22 cm long, tapering gradually into the winged stalks, entire or irregularly short-toothed, smooth or slightly hairy, 3- to 5 (7)-veined; stem leaves lacking. 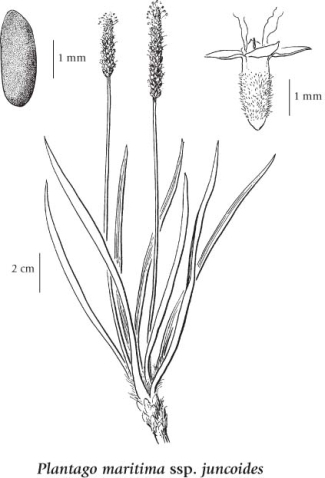 Inflorescence of dense or lax, bracteate spikes, 2-10 cm long; corollas greenish, hairy outside, 4-lobed, the lobes 1-1.5 mm long, spreading; bracts broadly egg-shaped, shorter than the flowers, minutely fringed; stamens conspicuous. Capsules, egg-shaped to broadly conic, 3-4 mm long; seeds 2-4, ellipsoid, about 2 mm long, brown or black, flat on the inner surface. Salt marshes and coastal beaches in the lowland zone; common along the coast, rare inland in NW BC (Mess Lake Mineral Springs); coastal N America and S America.